With April 15 only weeks away, nearly half of all Americans don't know they're now required to declare on their tax returns whether they have health insurance, a survey released Thursday reveals. Even among those who have already filed their returns, a surprising number either didn't see the box they had to check to indicate health-coverage status, or were unsure if they did, the Kaiser Family Foundation survey found. The findings come as tax season kicks into high gear, and as Obamacare has led to a historic reduction in the rate of Americans without health insurance. The telephone poll questioned 1,503 adults, and had a margin of error of 3 percentage points. People speak with an agent from Sunshine Life and Health Advisors, as they discuss plans available from the Affordable Care Act on Dec. 15, 2014, in Miami. Last year, for the first time, most Americans were required by the Affordable Care Act to have some kind of health coverage or be subject to a tax penalty. But this year is the first that the tax is being collected—and the first time that income tax returns ask about filer's health coverage. The Kaiser poll found that 53 percent overall—and 57 percent of people without health insurance—know that this is the first year they are required to disclose their coverage status. About a third overall named a different year for the requirement, and 16 percent admitted to not knowing when the requirement starts. Among respondents who personally completed and filed their returns, 76 percent said they had seen "a place to indicate whether they had health insurance," according to Kaiser. But the remaining self-filers either didn't see such a place, or were unsure if they did see it, the poll found. Continued ignorance about the key ACA feature recently led the federal government and most states to announce a special enrollment period in Obamacare insurance plans for tax season, after the original Feb. 15 sign-up deadline had passed. The grace period, which began in most of the U.S. this week, allows uninsured people who didn't know they would be subject to the Obamacare penalty until tax season to sign up for a 2015 health plan. A top federal official last week said that the grace period will not be offered again. But Kaiser Family Foundation CEO and President Drew Altman noted that "a solid majority" of respondents to the poll were in favor of offering that kind of waiver next year. Fifty-eight percent of respondents said uninsured people should be able to enroll in coverage in order to avoid paying the Obamacare fine. "It just seems reasonable to them," Altman said. In other results, the survey found what Altman called a "a very significant narrowing" of the gap between the percentage of people who view Obamacare unfavorably and those who view it favorably. As of this month, 43 percent view the law unfavorably, and 41 percent view it favorably. "It's essentially a statistical dead heat," Altman said. 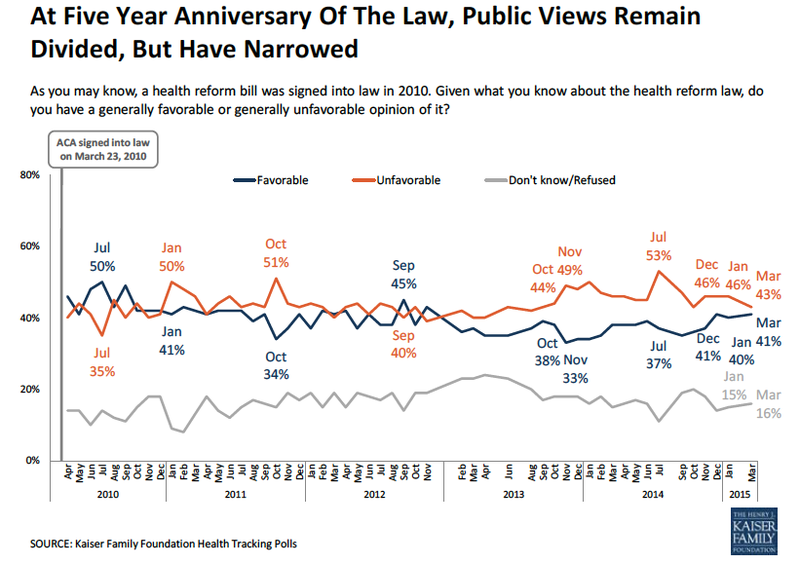 The law has been unpopular among the general public since early 2013. It was viewed most negatively during the botched rollout of HealthCare.gov and other Obamacare exchanges in late 2013, when just 33 percent of the public supported it. The Kaiser poll also found strong support—regardless of political affiliation—for the subsidies that help most Obamacare customers pay for their insurance. Those subsidies, or tax credits, are at risk of being eliminated in at least 34 states served by HealthCare.gov due to a pending Supreme Court ruling expected in June. Fifty-three percent of respondents were unaware of the case, which threatens to take away billions of dollars worth of subsidies to about 7.5 million people. A quarter said they have heard only a little. But when told about the potential effect of the ruling, 62 percent of respondents said removal of the subsidies would have a negative impact on the country. Sixty-nine percent said they would want current HealthCare.gov states to set up their own Obamacare exchanges if the court rules that only state-run marketplaces can sell subsidized insurance. Although support for that idea was highest among Democrats, at 82 percent, a total of 58 percent of Republican respondents also endorsed that idea. Likewise, a strong majority of all respondents, 65 percent, said they believed Congress should pass a law allowing people in all states to receive Obamacare subsidies, regardless of what kind of exchange they are served by. But most respondents had little confidence that Democrats and Republicans could work together to craft such a law. "For the public, what we're seeing here is just a basic question of fairness," Altman said, referring to the subsidies. "It doesn't make sense to them" that an Obamacare customer could be denied subsidies in one state while another person elsewhere gets them based "just on who runs their website," he said. Altman said that if the Supreme Court invalidates the subsidies, "Democrats will have the opportunity to play offense really for the first time in the history of the law, accusing the right of taking benefits, financial help from more than 7 million people." On the other hand, Altman said, Republicans will be able to argue that Obamacare is discredited by the Supreme Court ruling, if the court rules the subsidies are illegal. Plaintiffs in the case claim that the ACA only allows subsidies to be issued to customers of state-established exchanges, because the law does not explicitly say they be given to customers of a federally run exchange. HealthCare.gov was created to serve customers in states that opted not to run their own marketplaces.